1,165,508 photo from 4,111 competitions (9,005 events with photo galleries). 32,438 couples have their photos. 7,160 videos from 901 competitions (1,365 events with video galleries). 47 couples have their videos. We also hold information about 15,095 dance studios and schools in the USA and in the UK. We have now 1,165,508 photos in our galleries. Browse all 42 galleries on this website. 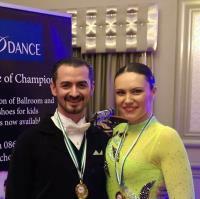 Read news from Dancesportinfo team. We publish here the latest changes on our site. We continuously update our competition results database. Just added Marin Atlantic Open 2019 - Junior 1 E Combi (Spain - Marín, 30 Mar 2019) results. We currently have 597647 events with results in the database.